The best care I personally have ever received (since childhood) has always been careful about how I’m feeling, and kind to me, now matter how badly I was feeling. Healthcare can be that great– it’s healthcare’s potential. I really, really honor the doctors and nurses who are able to blend their long professional education and clinical experience with that kind of caring – especially in the increasingly nasty financial environment they all face (at least in America) as money pressures imposed by management and insurance companies increasingly interfere with what both patients and clinicians want. All praise to these clinicians, who insist on being caring professionals regardless of the pressures. It’s really, really important to understand how the principles in Saturday’s post translate into thinking about the patient’s world: the life of the individual patient, with his or her challenges. Why’s that important? Because so often health planners complain about the difficulties of patient “compliance” without thinking concretely about the challenges of doing everything right. If you give anyone more work than they can handle, don’t blame the victim. That’s abusive … and besides, you’re recommending something that’s not going to work, which is a waste of breath. That’s healthcare’s potential. See how it plays out in the speech video. We are really obsessed with the question: What is best for me and for my family? From this question stems the others that require a joint understanding of what is the patient situation that requires action; what are the actions that are available and sensible and address the patient situation in a manner that fits their context and reflects what patients consider important and the reasons they have to value such things. He also pointed out that the post really “didn’t do justice” to the concept. Well, yeah – one thing at a time. :-) We gotta start with the basic idea. For patients with chronic conditions, they have to make treatments work in their daily life. To enact those treatments they need time, attention, effort, support that normally goes to other aspects of life. 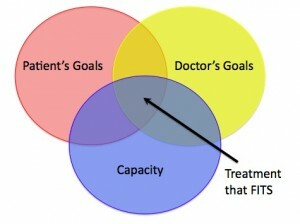 So treatment competes with life for these “resources.” If the treatment work fails to note that, and life always win, then there will not be enough capacity to enact treatments and patients will be considered noncompliant, even though this is the result of OUR joint failure to design treatments that fit. So we do not see much room for “doctor goals” and “patient goals”.There is the patient situation and we have to work out together how to address it. Goals are too future oriented to be real (try answering “how do you see yourself in 5 years” 5 years ago – would you see the [you] of today? I seriously doubt it). Ratherfocus on the present and see howpotential futures may play in what we need to do today. But not just in abstract but considering the challenges and opportunities of your life situation. And not just to make some tests look pretty but to really advance your situation in a manner that is meaningful to you and to your family. The other thing, which I think will start coming to a head in 2016, is that in addition to financial pressures, this change is full-blown culture change. As in all culture change, we as newly activated, responsible consumer-patients must raise our own consciousness about what’s important to us and what we say it would feel like to really be TAKEN CARE OF. What stories do you have, of being well cared for or poorly cared for? Please respond in comments. Cancer survivor “e-Patient Dave” is an international keynote speaker on healthcare who consistently earns extraordinary ratings by understanding each audience and working closely with each client to define their unique “home run.” Audiences have ranged from the Institute for Healthcare Improvement to the Danish Patient Safety Association and the Israel Internet Society. His compelling TEDx Talk “Let Patients Help” was for years in the top half of most-watched TED talks of all time. 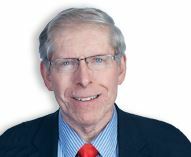 Visit his website at http://www.epatientdave.com.